Situato nel centro di Girona, a 3 minuti a piedi dalla Città Vecchia, dalla Cattedrale e dai bagni arabi, l'Hotel Ultonia offre camere climatizzate con connessione Wi-Fi gratuita, TV a schermo piatto e minibar. A 5 minuti a piedi da una varietà di ristoranti e bar, la struttura mette a vostra disposizione anche una colazione a buffet, un bar-caffetteria dove potrete gustare un drink o uno snack e una terrazza panoramica con splendida vista sulla Cattedrale di Girona e sui dintorni, accessibile da maggio a ottobre. Durante il vostro soggiorno potrete inoltre usufruire gratuitamente di un deposito speciale per biciclette e di un parcheggio privato sotterraneo, provvisto di spazi per le moto. L'Hotel Ultonia sorge nei pressi del Parco Devesa e a soli 10 minuti a piedi dalle stazioni degli autobus e dei treni, con buoni collegamenti con l'Aeroporto di Girona-Costa Brava, dal centro congressi Palacio de Fires e dall'arena cittadina. Il personale della reception, disponibile 24 ore su 24, sarà inoltre lieto di fornirvi informazioni turistiche su cosa fare e vedere a Girona, a Barcellona e lungo la Costa Brava. The view was terrible-on to an inside space and not able to see the sky . I would not want to spend any time in the room except to sleep I am not good at not being able to see outside ,however I did not ask for a room with a view. excellent location to city centre and a better base for exploration than somewhere on the coast. Staff helpful about local restaurants. Well appointed modern hotel in excellent location, five minutes from the Place Independencia and over the river to the old quarter. Lovely big room with an excellent en suite. Location is rather good, close to the old town. Also, the hotel has its own parking what was one of the must have points in our case. Beds are not comfortable, but for a short stay it's ok. Very good location for siteseeing. Parking available. There was nice balcony in our room on seventh floor. Breakfast is too expensive for offered variety of food. Feaniture is old. aesome location and very nice services. lovely room. they recommended a local restaurant - it was so good we went back the next night too! thank you! Excellent for the price: good location, confortable, kind staff. It is worth the money we paid. Very good location - close to the old part of the town which was really a marvelous walk. Close to the most wonderful restaurants. The staf was very helpful and amicable. Our needs were fulfilled very quickly. The central heating system did not work properly so was a little bit cool in the room but as long as we stayed 1 day it was ok - we were given extra blankets. THe electricity went out during the night but was quickly fixed in the morning upon our request and call to the administrator. Very clean and comfortable with helpful staff. Better quality toilet paper would have been nice otherwise no issues. Good location, friendly and helpful staff, excellent breakfast. It was winter and was a bit cool in the room, air conditioning should be renovate. Stayed in a superior double room - it was nice & modern, great parking under the hotel, within walking distance from everything. Wonderful hotel! Good Location, Great Hotel.Gran Ultonia and Ultonia shares the same entrance and the same palace.. the infrastructure is like a 4 star hotel! A little bit difficult to find the parking, just stop somewhere near the hotel and ask to receptionist, otherwise no easy to clue the parking entrance. No hair dryer. 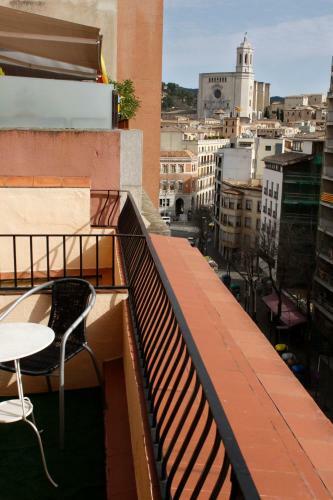 this hotel is situated at a perfect location in the city center of Girona. in the vicinity, many options for dining. We had the upgraded 4* family room and that was just great.. New and a comfortable bed. Also a great underground parking. The prices for breakfast! For a family of 4, I recommend you to have a very tasty breakfast at the other side of the street where Vienna cafe is established for far less money. Great coffee's and wide range of sandwiches among them also "the best sandwich(Iberico) of the world" voted by NYT. Very central within walking distance of everything. The room had no windows to street and felt very enclosed. Value for money - superb!! On-site underground parking in a very busy part of the city - so convenient. Room 118 (ground-floor bar) again good value for money, staff really good and fast. There is no doubt that we will use the hotel again, a we live less than an hour´s drive from Girona, and this was our first visit to the city. We went for 2 days, but 2 weeks would hardly suffice to take in the astonishing architecture and beauty of the old town. Only one small issue - the toilet fittings in the en-suite were a bit dated, and it would have been better if a toilet brush had been supplied in the bathroom. Location was excellent. Easy to drive to, good parking. Excellent breakfast buffet. Quadruple room was a little small, and walls were thin so we could hear noise from the room next door. Stayed four nights and found this hotel to have everything we needed. Very well located for spending time in the old part of the city. Staff very polite and helpful. All spoke good English. Our second time staying here and we will be back. Shower gel/shampoo provided by the hotel is useless. Bring your own. We felt our choice had been spot-on for our requirements. Central location, secure parking, side room looking over garden, friendly and helpful staff, excellent breakfast and overall very good value. Bathroom surface space was good (often missing). No complaints. OK, parking wasn't easy but it was manageable. We had a nice room on the top floor with big balcony. Location is close to old town. We wanted to stay extra night and the staff let us do it with same price as first night. Location is great just minutes away from the beautiful old quarter. Lovely room & very comfortable. Car park was difficult to get into & we thought it was closed as didn't realise you had to press buzzer. The location is great, v close to the old town and cathedral, you could spend hours in the old town its very pretty lovely little shops and cafes.Reception staff could not be more helpful, great with giving directions and reccommending places to go. Not the hotels fault but our room was way too hot as it was unseasonably warm and they had switched off aircon for the winter months. The staff were extremely friendly and helpful at all times. We were allocated a room which was unsatisfactory,top floor and in needofsoundproofing/refurbishment. on request we were immediately re-allocated a suitable room. Girona is a fabulous and fascinating city to visit, the old city within the city - beautiful. This hotel is a mere stroll from the old town and the abundant restaurants - from those surrounding the major square to the many beautiful alleyways leading to and from- all offering excellent fare. Of course, in Spain, lunch is the main dining experience for many, and tapas abounds in all it's glories, however after 8pm night dining is just as fabulous. Parking is always a drawback in Europe/fee/space wise, and this hotel is no exception, however it is a manageable space, and secure, and that; you pay for. A perfect place to meet my friends. Very convenient for visiting all the places of interest in and around Girona. Staff very friendly and helpful. Room was spotless. Will probably book again in the new year. Excellent ! The front staff were very knowledgeable and were able to converse in a variety of languages and accents. The location was excellent as it was close to the old section but not too close so that the night noises were distracting. Great value for money. Great location-we didn't want to be outside the old city. We did pay for parking, which isn't cheap, but we thought it was worth paying the extra so we could be within walking distance of the old sites. We stayed in the cheaper part - Ultonia (there is also 4 stars Grand Ultonia sharing the building), but everything was first class. Everything is very modern, staff was excellent, and there is underground parking - luxury in the city! The party noise from the street was very loud and lasted until 4 p.m. Typical for Sat night in Spain, but slightly unexpected given the rooms were on the 6th floor! The location is great , is near to the city center and it's only 10 minutes walking to the central bus and train station. We like the castle, shops and restaurants.Hotel is the centre very close to railway station. It was good. It was quite noisy all night from the street. Closeness to old town and great Tapas at Txaloka, friendly staff. Scary narrow, difficult and slightly overpriced parking below the hotel. Our request for 3 single beds was granted. The room was spacious and clean. The hotel was convenient to both old and new parts of the town. Staff were very helpful. There is nothing we didn't like. Location was excellent and good value. I thought the car park charges were a bit high. It is easy to find in the center of Girona, It has a garage under the hotel. Always friendly and serviceminded staff. The AC in room 408 didn't function good enough. We was told that service would be taken on the AC when we not was there, men it did not do eny difference. staff really friendly, nice room very spacious, great central location, would definatley stay here again. Nice Hotel, room big and clean, very good position close to the old town. Staff was very helpful and friendly. Location was perfect just 5 minutes walk from Old Town center. Hotel is very comfortable with all facilities. The roof top bar is amazing, I loved the design, views and food was good as well. Very good value for money. Hotel seems recently renovated. Very close to the historical centre. nice location.. nice price.. very friendly staff.. good choise..
Got upgraded to a lovely room, nice bathroom with plenty of space , good wardrobe space, good size mini bar and very clean with maid service daily, impressive roof terrace bar with a friendly atmosphere. First and foremost the staff is great! Helpful and friendly. The hotel is modern and well appointed and is located in the center of the city. There is a great Tapas restaurant and bar on a patio on the upper floor which seemed to be a go to spot for the late 20s to early 40s set. But there was no noise from this in our room. The hotel is a few blocks from the historic walled city which is truly stunning. We had just come from Carcassonne in southern France which is great but in comparison felt like Disneyland. Girona is less crowded and in many ways more pleasing than Carcassonne. Perfect spot to explore the beautiful city Girona. Noisy, thin walls, could hear next door. Dodgy shower. Staff is friendly, introduced the way to old town for us. Hotel is very modern with nice facilities. It has elevator, sofa etc. Room is very clean, we had a very nice balcony, big bathroom. Air condition is in the room. The sewer pipe is blocked. Hotel Ultonia is well located in Girona. It is only a short walk of less than 5 minutes to get to the old part of the city. It is very quiet and has excellent service. The room I was given intially was not fit for a back-packer, dark, 40C when I walked in, no working AC, no desk, ancient furniture, dingy batchroom and it stank of urine. I complained and their staff said they didn't realize I was not a back-packer, but on business and thats why I got this room. This was really poor as the room I finally got (3rd time lucky) was completely different from the 1st (very nice, modern with AC) for the same price. Disgraceful really. Clean, friendly courteous staff, affordable parking in the hotel, close to city centre. Excellent room for four - in fact two rooms within one. Staff at reception helpful. Minor quibble only that the shower curtail was not quite long enough so water inevitably went on the bathroom floor. No tea and coffee making facilities, which appears to be common on the Continent anyway. Air conditioner worked fin, but seemed to have a mid o its own and turn back on even when we turned it off. This hotel is In the centre very good location for site seeing and eating out The rooms are very good Clean and tidy General areas very clean Breakfast very good choice. Staff very helpful. We have stayed in this hotel when traveling and would highly recommend. Good location. Very friendly and helpful staff. Good breakfast. There was no a cot for a child in the room, though we reserved one. The noise from the street was quite loud. The roof top terrace bar was great - wonderful for a last drink and an evening view of the mountains. Rooms were basic but clean. Excellent value for money. Great position close to the old city. Couteous and helpful staff. Air conditioning was not very effective at times. the hotel is near everything, from there you can walk to both sides of the river is 2 minutes! has everything, even a cafe-restaurant full of people! the sheets were a bit smelly and the charged us two extra beds instead of one! Noise from the street as well as from neighbours (very thin walls) ! Earplugs recommended !! lack of parking front of house, the car park itself is a surprise! Older hotel that met the needs for lodging of a family with older children. Short walk to the old city, many choices for restaurants. Staff was helpful. Beds were hard, older facility but all was in working order. Hard to locate because the city doesn't mark the streets well. The people of Girona are friendly. The city is large and urban. I believe that the air conditioner did not work in my room (on the 5th floor) and I was unable to make it work. Sleeping was uncomfortable in the room. There was much noise in the streets (loud shouting and screams) well past midnight. Finally, the walls let the slightest sound in the room, that you would hear your neighbors whispering and snoring as if they had been sharing the place with you. Good secure bike room Very clean, staff friendly and efficient. Good location, good breakfast options. Last minute booking which exceded expectations. Ok we like the room. Lovely Hotel, very clean and staff helpful. Good value. Girona is a beautiful city. Room and bathroom need updating. Very good hotel, It has style and didnt cost a lot. There's a very interesting bar on the roof. People are friendly and it's clean. Great breakfast buffet (except for coffee), free newspapers, great location, nice terrace bar with view, clean, spacious and comfortable, nice value for money. If you are very sensitive with noise there could be some small problems with room isolation, but not really a problem for us. Room was large & clean. There was plenty of space for a crib which btw was provided by the staff. Roof terrace was very relaxable Close to main city attractions Staff friendly. Hot water from caffee machine available in Hotel's restaurant. Recommended as family friendly but despite crib in the room there were neither facilities to clean infants (bathtub) nor facilities to prepare milk (kettle). Location. Close to the old city. Noisy impossible to get a good nights sleep. not only could you hear the party goers out on the streets most of the night you could also hear people snooring in the next room as clearly as if they were right next to you. The hotel decor for the 3 star hotel which we stayed in was dated old and run down. Good value for money; spacious room in the old part of the hotel (the Ultonia, as opposed to the Grand Ultonia, the adjacent four-star annex). Public spaces (reception, breakfast room, bar) are modern and well appointed. It seems to be on the 'way home' from the downtown bars. It seems that its own bar ('El Secret') is one of the obligatory stops on Girona's bar crawl, judging by the nonstop noise from revelers throughout the night up until 6am, at least affecting the rooms facing the main avenue, Avinguda Jaume 1st (three-star original property; chances are the four-star annex is sound-proof?). The area itself is probably useful, functional and perfectly decent, but charmless and impersonal, nicer areas of Girona however are within easy reach. Not sure we'd stay there again, because of the noisy location. Clean, modern and confortable hotel right next to the Old City in Girona.Big room, good breakfast. Parking garage, friendly staff, plentiful ice supply, location.